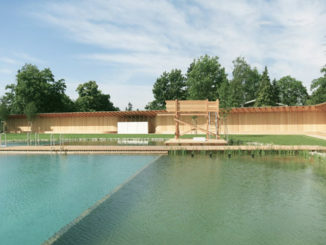 Public swimmingpool as a wooden construction and pool in form and appearance of an almost natural pond. Water treatment and purification by biological filter terraces (“neptun filter”) without chemical additives. The Filter concept is modeled after the natural terrestrian water purification through layers of gravel, sand and soil and an additional basin containing waterplants.